This morning was a follow-up appointment with my GP to review blood tests results following my annual check up. Turns out I've been a fairly good boy. I rewarded myself by taking the slow route to work while listening to Jazz FM. The music playing softly in my helmet matched my mood, and the lake's mood, to a 'T'. 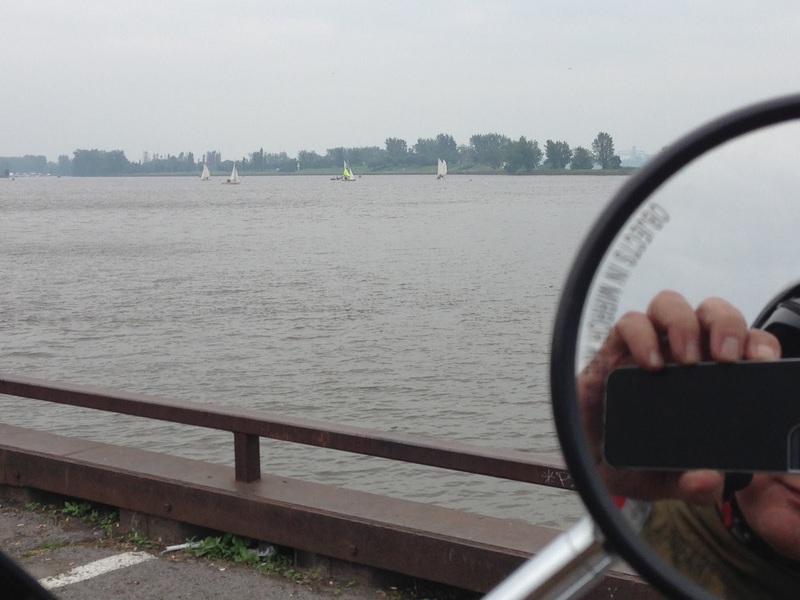 These photos, taken kilometers apart, one in Pointe Claire, one in Lachine show a common theme: it's high season for sailing school. The sailboats that the yacht clubs use to train fledgling sailors remind me of ducklings. A flotilla all askew, and not going anywhere in an orderly way. Except the drink that is, when the skipper muffs a turn, or tack, or whatever the correct nautical term is for low-siding or high-siding a sailboat. It's a shame I have to work. 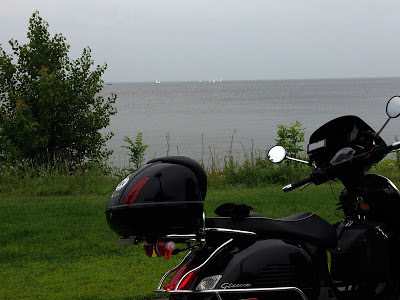 Ah working in summer, it is hard to make the bike behave and want to pull into the parkinglot, particularly when I am seeing and feeling summer full-on. Glad you got a great health report card. "Seeing the water dotted with little sails is a common summer sight here too: kind of relaxing to sit and watch them dance on the waves isn't it?" Sadly Sonja, the only path to health is to be good 90% of the time. And even then, it's a downward slope I'm afraid. Thanks Dar! Summer is indeed a joy. Even though we appear to have switched weather with you lucky folks on the left coast, we're still having plenty of fun to be thankful for. Karen, sorry for my clumsiness, I fished your post out of my e-mail. Sailboats on the lake are the essence of summer, aren't they. You know that those sailors and their guests and cruising along with a glass of wine or a beer in their hands, the wind in their hair, soaking up the sun and feeling relaxed and wonderful. The students on the other hand are mostly wet from dumping their boats, and fairly tense and stressed trying to avoid a repeat performance. Their time for wine and beer will come. In the meantime they'll have stories to tell back at the club over a landlubber's beer. Aaaargh! Typos in comments are the bane of our collective existence. I think one just has to be Zen about it. At least the meaning is generally clear. I know we just complained about the rain for 6 months but with temperatures in the high 90's for a week I'd like to say your weather looks awfully refreshing. All right Trobairitz, no complaining allowed from the wet coasters! It seems, as regrettable as it may be, that the coasts have traded weather patterns, for the time being at least. So please try to buck up and deal with the sunshine and heat. I know it's a chore, but do you hear us all in your faces over the crappy, cold, rainy weather we've been kind enough to relieve you from, now do you? Just know that we love you guys, and we're pleased that we can come to your aid and shoulder some dismal weather for a change.